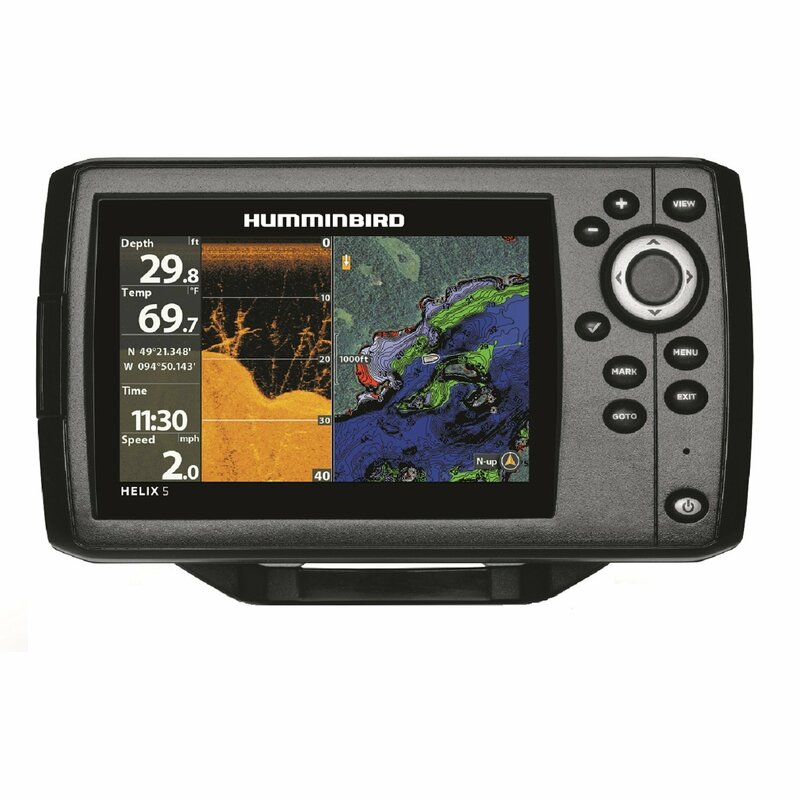 The Sitex ColorMax Wide chartplotter we tested was paired with the Sitex ES502 black box sounder to provide both plotting and sounder capabilities. This unit will also accept radar inputs from a Sitex radar sensor. The ColorMax Wide comes with a quick-release bracket that allows for easy removal of the display without fooling around with any wiring or connectors. A nice feature but, in our opinion, the bracket is a little wobbly. Flush mounting is another mounting option and can be easily accomplished using the threaded holes on the rear panel. Installation wiring is more complicated on the ColorMax with the black box sounder than on some others units we’ve tested. Several small wires need to be connected from the display mount to the antenna and the sounder. Plus, the sounder black box needs to be mounted in a spray-free environment. The Sitex Colormax Wide uses a landscape sreen layout, measuring 7 inches on the diagonal, and carrying a resolution of 480 x 324. It has six levels of brightness and 11 levels of contrast control. Using a combination of these controls and one of the four selectable color palettes provides more than ample management of the screen brilliance in day or night conditions. When viewed in sunlight with polarized sunglasses, our tester noted no screen darkening. We rated the ColorMax wide excellent for both day and night viewability. Selecting a present position waypoint with the ColorMax Wide is a two-step process making it take a tad longer than some of the other machines. Placing the cursor on a waypoint brings up soft key functions to move, delete, edit, and goto that waypoint. Routes with up to 50 waypoints can be built right on the map page with the cursor and enter key. Then once a route is built you can easily move waypoints or modify it on the map page. The Sitex ES502 black box sounder has dual-frequency capability (50/200 kHz), 500 or 1000 watts of output power, zoom, full-color A-scope, shift, and water temperature display. To select the sounder screen from the map page, you must go deep into the menu system. The soft keys for the soundergain, noise, and rangebecome active when the unit is displaying the sounder in full screen, or when the sounder is the active window in a split-screen display. There is no fast way to select full or split screen sounder. The sounder worked best when we operated it in manual modes; auto gain and depth ranging did not work very well, in our estimation. When compared to the other units we’ve tested, the ES502 only managed a fair rating for ease of use and a good rating for presentation. This Sitex chartplotter includes two map orientation choices, an adjustable easy-to-see course predictor line, and adjustable data boxes. Limited split screen capability and less-than-friendly software hold this unit back.